History:-Agra is the foremost tourist spot in India and has been equipped with all kinds of infrastructure facilities for tourists. The city with multi colored illuminations providing a marvelous view at night offer hearty welcome to its tourists. 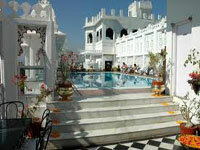 Many high standard hotels and resorts add the enjoyment of the vacation and picnic to its pinnacle in Agra. Culture:- Agra is an exquisite centre of culture and arts. The specimens of art and culture in the great Agra city are not only impressive but are also the mirrors of the cultural and artistic talents of the Indian populace during the grandeur past. This city houses many ancient temples, mosques, forts, several mausoleums, tombs and historical monuments. Agra Fort and Taj Mahal are the incomparable structures in the city. Apart from the well accomplished grandeur monuments, Agra is renowned for many art performances. Breathtaking traditional paintings, folk dances, folk music, embroideries, unparallel cloth designing and stitching are the reminiscences of the past glory and some of the talents are still preserved in this historical town. Sculptors, jewelers, musicians, painters, carpet makers, artisans, metal workers, weavers and embroiderers were frequent visitors to the Royal courts during the Mughal Period. There were many talented artists and artisans were there among the locals. Balkeshwar Temple located on the banks of River Yamuna, Kailash Temple placed at Sikandra, Mankameshwar Temple at Rawatpara, Prithvinath Temple situated at Rajpur Chungi and Mahakali Temple located at Sikandra are some of the important temples in Agra. These temples are the hub of religious and cultural activities. Travel within city:- Agra is one of the most popular tourist destinations in India, and the reason for this is quite well known. Agra houses one of the Wonders of the World. The tourist influx in the town of Agra is always quite heavy due to this reason. Travelling around the town of Agra can be done through a multitude of ways, including electric buses, Tongas, tempos, cycle rickshaws and auto rickshaws. Cycle Rickshaw:- Cycle rickshaws are available aplenty in the town of Agra. Traveling through a cycle rickshaw can be quite time consuming, although this is a very cheap mode of travel with charges hovering around Rs 5 to 10. Tonga:- You can also opt for Tongas in Agra. Tongas are horse drawn carriages that run throughout the town. Tonga charges are very low too, and you can opt for a Tonga ride as it is faster than a cycle rickshaw ride. Charges will range around Rs 5 to 15. Bus:- Electric buses in Agra cover all the major areas in the town, but these tend to be crowded normally, hence opting for buses is not a very good option. Charges are very low though, ranging from Rs 3 to 6. Tempo:- Tempos are also available, and these are shared vehicles which can be more comfortable than buses for slightly elevated rates. Tempo rates will vary from Rs 5 to 10. These are a safe mode of travel and can be taken up during night time. Nightlife:- Present Agra thriving with many facilities has much in store to offer great night life. The restrictions on the Indian culture on night life are visible in Agra significantly. The Taj Mahal at night with all kinds of multi colored illuminations, the grandeur reflection of the majestic monument in the serene Yamuna water and the street vendors selling art crafts and fast food is really enjoyable. One can have the maximum enjoyment during the days with more moonlight. Taj Mahal brings in mind the grandeur castles in fairy tales. Five nights around the full moon day are great days for viewing the eternal beauty of the Taj Mahal. The outskirts of Taj Mahal complex houses many movie theaters, pubs, cafeterias, Internet cafes and bar parlors. They are open mostly up to midnight 12'o clock. One can spend evenings in the Agra Fort by viewing the splendid light and sound show depicting the rich stories and glorious past of Agra. Shopping:- Agra is known for impressive monuments, but also is equally renowned for traditional arts, paintings and handicrafts. 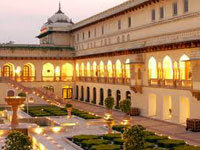 An enthusiast traveler can enjoy the shopping in Agra very much. 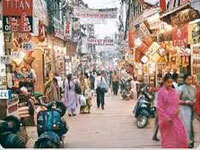 One can get all kinds of metal wares and fine crafts from the street stalls to super malls in Agra. The city is famous for much rare collection of handicraft items, valuable leather items like shoes, belts and bags, exquisite jewelries, foot wears and embroidery works. Agra brassware and carpets are renowned world over. Agra's delicious taste is a favorite attraction for tourists and the sweet taste lies in the pedas, gajak and dalmoth. Agra is a favorite spot for Mughulai cuisines as well. Munro Road, Kinari Bazar and Sadar Bazar are the main shopping areas in Agra. These main markets are located in and around the Taj Mahal. One can shop for handicraft items and artifacts from Government owned Gangotri, the UP State Emporium located at the complex of Taj Mahal Complex. This emporium has marvelous collections of marbles, leather items, brassware items and textile items. History:-The history of Jaipur dates back to the year 1727 when the city was discovered by the then king, Maharaja Jai Singh II. The king shifted his capital to Jaipur from Amber due to the increase in population and reduction in the water levels. Jaipur prides itself on being the first planned city in the country as Maharaja Jai Singh II was deeply interested in the designing and construction of the city. Since the Marathas were constantly attacking and trying to take a reign over the city, the king was very skeptical about the security of Jaipur. Thus, with the assistance of Vidyadhar Bhattacharya, a Brahmin scholar of Bengal, Maharaja Jai Singh II started the construction of Jaipur in 1727. It took around 4 years to build the entire city and huge buttressing of walls was created to ensure the safety. Constructed on the pattern of Shilpa Shastra, the Indian Architecture, the city of Jaipur was divided in nine blocks wherein there were two state buildings and palaces. The rest of the seven blocks were given for the public use. The city was referred to as 'pink city' only in the year 1853, when the whole city was painted pink to welcome the Prince of Wales. 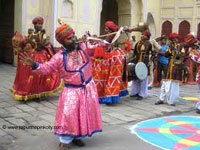 Culture:- Located in the eastern Rajasthan, this city of Jaipur is popular of the amazing forts and stupendous palaces. This royal town has magnificent architecture and is the first planned city of India. The buildings here are made with pink-painted sandstone which brings it the name of Pink City. With fantastic attractions all around the city, it invites tourists from all over the world. Jaipur's rich cultural heritage is displayed in the traditions, customs, lifestyle, art and architecture of this place. In fact the best understanding of Jaipur's culture can be attained through its art, music and architecture. The splendid monuments of Jaipur deserve a visit. Those huge fortresses of Mughal and Rajput reigns, the Hawa Mahal, Amber Fort, Jal Mahal aptly describe the culture of the city. Jantar Mantar of Jaipur, the largest of all five similar monuments is an observatory basically, which is indeed an architectural spectacle. The people of this lively town are friendly and warm. Their colourful outfits and unique jewellery are the part of their culture displayed in a flamboyant way. They love to dance to the tunes of Rajasthani folk songs. 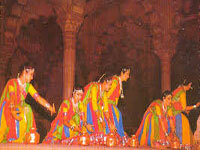 Famous dances of Jaipur include Ghoomar, Chari where the dancers got to dance on a pot with a lit diya on their head. Traditional instruments like Sarangi, Ektara, and Jhalar are also played while singing folk songs. Food or the local delicacies of Jaipur also reveal the culture of the city. Jaipur's utterly delicious mangodi, papad, khichdi, buttermilk, sohan halwa have no match. Also famous for its handicrafts, Jaipur has markets flooded with handicraft items. Carved silver jewellery, kundan as well as meenakari jewellery, ivory carved sculptures, wood work and leather goods, are all so finely made that they would undoubtedly catch your eye. Known for blue pottery, miniature paintings and traditional clothes with work of bandhni, zari and zardosi, are certainly the best examples that depict rich culture of Jaipur. Travel within city:- Jaipur is one of the most popular tourist destinations in India, and the city is very well planned out in all levels, including transportation facilities. There are public transport buses that tourists can opt for while in Jaipur, and there are auto rickshaws, cycle rickshaws and taxis available for commute too. Bus:- The cheapest way to travel around Jaipur would be through the public transport RTDC buses that ply to all major areas in Jaipur. 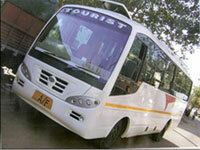 Sightseeing bus services are available too, and you can opt for full day tours, half day tours and night tours. You can book your sightseeing trip through these buses online in the Rajasthan Tourism Department Corporation website. Bus charges will range from Rs 150 to 300 for sightseeing trips, depending on the class of travel opted for. 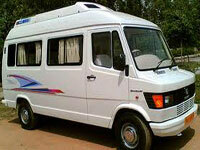 Taxi:- Taxis in Jaipur are very comfortable, and they are available from airports, bus stands and the railway station. Taxis run on meter, and charges will hover around Rs 12 per kilometer. Cycle Rickshaw:- Cycle rickshaws charge anywhere from Rs 10 to 30, but this mode of transport is very slow. Tempo:- Auto rickshaws in Jaipur are a good way to travel around the city, and you can rent out an auto rickshaw for Rs 350. Auto rickshaws do not specifically run on the meter, so you can get a sightseeing slip from the police department and travel around visiting all the locations in an auto rickshaw at a predetermined price. Auto rickshaws are a safe way to travel within the city at night, and there are no special night fares. History:-The Lake city of India, Udaipur, prides itself of having one of the most royal histories. Legends have it that the city was founded by Maharana Udai Singh who came upon a recluse at the Pichola Lake. The sage blessed the king and asked him to build a palace on the very spot, as the place was well protected by the Aravalli Hills. The king did so and moved his kingdom to Udaipur after the Mughal attack at Chittor. The city was established and named as Udaipur in the year 1557 A.D. The city was under the rule of the Sisodia Kings, who claimed to be the progeny of the Sun God. They are also known to be the oldest and the most powerful ruling family in the world. After the downfall of the Mughal Empire, various small clans like the later Maharanas and Sisodias ruled the city. They captured all the parts of the city except the Chittorgarh Fort, which continued to be under the Mughal flag. King Jehangir, in the year 1616, returned the Fort to the ruling Rajput kings. Udaipur continued to be the capital of Mewar until the throne fell into the hands of the British in 1818. It was then declared a princely state and held the same title till 1947, when India gained independence. 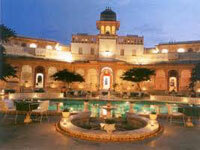 Travel within city:- Udaipur is a very picturesque and famous city in the state of Rajasthan. Tourists flock to the town in order to catch a glimpse of the famous structures present in Udaipur, including the City palace, the vast Udaipur Lake and the Jagdish Temple. All these places can be easily reached through one of the various modes of transport available – including taxis, Tongas, auto rickshaws and city buses. Bus:- The government bus service in the city is not too frequent, and this is why many tourists don't opt for buses although the fares are cheap around Rs 3 to 8. Taxi:- Tourist taxis can be availed from the railway station and the main bus depot, and fares will range around Rs 100 to 200 for a trip within the city. Tongas:- Tongas or horse carts will also be available for rates of around Rs 5 to 15. Tempo:- The auto rickshaws in the city of Udaipur do not run on meter, and the fares may depend on the distance covered. It is essential for you to fix up a prior rate beforehand while bargaining with the auto drivers, as this way you can make sure that you do not lose much money. Auto fares may range around Rs 15 to 40 for travelling to the major locations in the city. Auto rickshaws are a fast and easy mode of travel, and can be preferred during night time. There are no special night fares.